(Nanowerk News) A new process developed by a team of researchers led by a Virginia Commonwealth University physics professor could bring significant improvements to a technique used to measure the size, charge and shape of water-soluble molecules. Joseph Reiner, Ph.D., an assistant professor of experimental nanoscience in the College of Humanities and Sciences' Department of Physics, and his co-researchers describe their findings in a forthcoming article, "Enhanced Single Molecule Mass Spectrometry Via Charged Metallic Clusters", which will be published in the journal Analytical Chemistry. Nanopore sensing is a process by which one can learn about the physical and chemical properties of the molecules in solution. The technique has led to major advances in the area of DNA analysis, but it has been somewhat limited when applied to other molecules such as proteins or metabolites. One reason for this difficulty is the short times that many molecules spend inside the nanopore. These short residence times make it difficult to accurately measure the properties of the molecules. 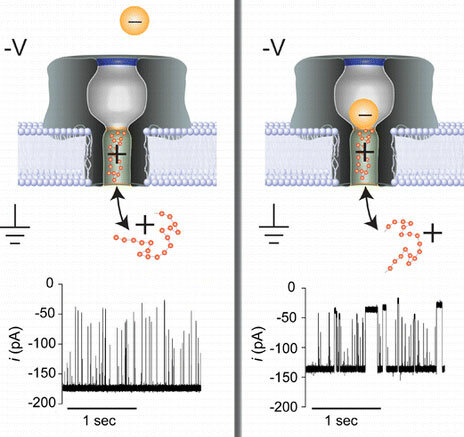 The article describes a new method to address the problem of short residence times by using charged gold nanoparticles inside the nanopore to keep oppositely charged molecules in the pore for longer periods of time. "We all know opposite charges attract, and we knew our gold nanoparticles were negatively charged so we thought that if we introduced positively charged molecules into the pore while a gold nanoparticle was there, then perhaps the molecule would hang around a bit longer inside the pore," Reiner said. "This is exactly what happened." By using this technique, Reiner said, nanopore sensing could potentially be applied to a wider range of molecules beyond DNA, and this may help shed light on how diseases develop and function. "My technique could be used to expand the number and type of molecules that could be detected and analyzed with nanopore sensing," he said. "Some of the molecules we are interested in detecting are known to play a role in disease development. By studying these molecules with our new technique, we hope to learn more about how these diseases function."